So this goddess hair product CF was collaboration of Kerastase and Elle magazine. Fashion magazine 'Elle' and luxury hair & scalp care brand Kerastase collaborated actor Shin Hye Sun's dramatic image was released. Shin Hye Sun, who was selected as the muse of Kerastase, stood in front of the camera as a perfect goddess for the newly released 'Goddess Oil Elixir Ultime'. Shin Hye Sun, who appeared as a gorgeous gold dress with a sparkling sequined queen and a brilliant wave hair that shines brightly for the theme of this campaign, "My Shining Moment," was a brilliant goddess. She continued her busy schedules with films and dramas, and she encouraged (독려하다) the staffs and built (이끌다 - lead, guide) the atmosphere without exhaustion. In front of the camera, she was praised by the staff throughout the filming with positive energy and perfect concentration. Saw some negative comments about this CF from netizens. But it's normal thing which I'm now more getting used to that. You will always find negative people everywhere (like below clip). What negative comments? You mean the Kerastase CF? Some of those comments on the Naver article about the Kerastase pics were a bit harsh. SHS likely knows better than to pay any mind to such ignorant comments, but hopefully she doesn't even see them. Yes, from Naver. But don't mind that 100 people who might never watched her drama. Anyway, I'm glad to see many of replies trying to defend her which was the sign that she got more fans. The Naver article was linked onto SHS' gall.dcinside thread, so many of those fans jumped into the article comments and replied/downvoted the bad comments. @Ni Wen personally I think those were just absurd and ridiculous negative comments. If article said that SHS is beautiful, they would just say she's not beautiful. If article said she is goddess, they would say no, she's not goddess. If article said her acting is good, they would say it's not good. If article said she will get another best actress award, they would just said that she will never get best 'actor' awards. If reading those comments made you upset, let's play "whack-a-mole" . Oppa CDK, please have mercy. Ok, the translation is bad and i don't really understand some of the comments but I see these words "not beautiful", "not a goddess" and "ugly". personally﻿ I think those were just absurd and ridiculous negative comments. It could be ... some fans who probably think of her as their favorites rival made those comments on purpose. Bashing is common online. Hae Sun achievements are ... where she started from and where she is at ... it’s something to write about. I personally root for those who started their careers doing secondary roles and ended up achieving lead roles by their talent and hard work. I think, one should give more respect to talent rather than beauty. You may find someone beautiful today and not tomorrow. And not find someone attractive today yet do tomorrow. Talent is something which never fades away ... and Hae Sun got plenty of that. Really loved and 100% agreed with your comment @jakey09 That's the same reason that I became her fan and will always support her. P.S. Good news for anyone who pre-ordered 'Hymn of Death' Blu-ray. It's now confirmed that SHS's interview will be added in special features (hopefully there will be Eng sub). P.S.2 I just read the news that Go-ara got injured from Haechi shooting and may not be able to appear in drama for a while (wish she get well soon). This made me worried about our SHS too, hope she will take care of herself and not overdo ballet training Please don't hesitate to use stand-in when the dancing scene is too hard, I don't mind that. Just want to post the Italian soprano song that Shim Deok sang in Hymn of Death. From the Opera, 'Rinaldo' by Georg Frideric Handel. At the end of the first act, the knight Rinaldo sits with his lover, Almirena in the garden. All of a sudden the evil sorceress appears and abducts Almirena. At the start of the second act, Almirena sits in her captor's palace garden mourning her predicament. Having been taken away from the love of her life with no hope of ever escaping, Almirena can only pray for mercy. And that I should have freedom. in my sufferings I pray for mercy. 4 actresses who began as supporting roles --> to main lead. And I think this is a great SHS fanclub from Taiwan, with lots of posts and frequent updates (if you can translate Mandarin ). Wow...I really love this one, because it's HD 1080p . Does SHS get additional compensation for any ballet training? Does she have additional insurance coverage during her ballet training? How extensive if her training schedule? YNK needs to send us copies of the contracts! Sweet! This is Secret Forest script! From Episode 7, about 30 minute mark. One of my favorite scenes of the whole story, between Hwang Shi-Mok and Young Eun-Soo (when she comes to visit him at night). The parts in parentheses are the comments for the actors to use. Such intensity on screen from such simple lines on paper. What an actor. What an Actress, Shin Hye-Sun!! the one and only! where she squats (she's a great squatter) and nuzzles her purse like it's her sweet smelling baby or something. Found an article about this senior actress complimented our Shin Hye Sun. Actress Jin Kyung interview "Shin Hye Sun, worthy noticed new-gen actress, acting so good". Actress Jin Kyung (48), mentioned Shin Hye Sun as junior actress who is worthy of attention. On the afternoon of the 21st, Jin Kyung conducted a round interview with the movie 'Sun Kiss Family' (director Kim Ji-hye) at a cafe in Samcheong-dong, Seoul. Today when she was asked to list the name of actress who she was paying attention, 'Shin Hye Sun' , she replied. She said the first time she watched Shin Hye Sun was from KBS2 drama 'Five Children' and instantly when she saw she asked herself 'Who is this girl ? She acted so well'. 진경은 "아니나 다를까 (신혜선이) 쭉쭉 크더라. 그 친구가 제일 눈에 많이 들어왔다. 연기를 진짜 잘한다. 요즘 잘하는 친구들이 많은 것 같다. 분발해야될 것 같다"고 너스레를 떨었다. Hiding my poor translation of above paragraph, because I'm so embarrassed. "Of course, Shin Hye Sun is tall and attractive. This person caught my eyes the most. Her acting is really good. There are so many good actors nowadays, so probably I have to work harder" . (P.S. If Jin Kyung watched SHS since 'Five Children' then she must be a big fan of SHS now. This is not the first time that I read actors, directors, staffs praised Shin Hye Sun. I think it's a proof of how good she really is. SHS must be glad reading this article. Since you ask, here's my take. This day when asked to "tell actors you are keeping an eye on", Jin-Kyeong answered, "Shin Hye-Sun". "On KBS 2TV weekend drama 'Five Children' I noticed Shin Hye-Sun-ssi for the first time. ('Noticed/stood out' so much such that) As soon as I saw her, enough to say, 'Who's that girl?' Her acting was so good," she explained. Jin-Kyeong said, "as expected, (Shin Hye-Sun has been) maturing by leaps and bounds. She's the one that caught my attention (eyes) the most. Her acting is really so great. 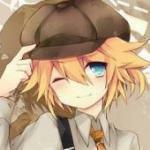 Lately there seem to be many fellows/kids who are good. I think I need to work harder (to keep up)," she exaggerated. 이날 진경은 '눈여겨보고 있는 배우를 꼽아달라'는 말에 "신혜선"이라고 답했다. 그는 "신혜 씨를 KBS 2TV 주말드라마 '아이가 다섯'에서 처음 봤다. 보자마자 '쟤 누구야? '라고 말했을 정도다. 연기를 너무 잘했다"고 설명했다. You should be quite proud of your effort, @immorethant. That paragraph is full of idioms that are not easy. 너스레를 떨었다 - Kind of exaggerated or over-did it on the story telling or action. Yes after reading the more senior actress' praise of her, adding to you guys' thoughts. It's clear to me that an actor's reputation among people who know her and work with her are much more important than among fans, who in general don't know what she's like to work with in person in a business full of egos and drama queens (although she literally is a queen of dramas now, ha ha). In all my reading and translating her interviews and articles about her, there have been these consistent observations pointed out in most articles - that 신혜선 is prettier in person than even on screen, that she's cheerful and outgoing on the set even after long hours, that somehow finds the energy to show genuine concern for the littlest on the staff, and that she's a joy to work with for everyone. I think having started so small and gone through a long period of no-name status, perhaps she had moments when she said to herself, "if I'm ever in the lead actress position, I will treat everyone well with respect and set a positive tone on the set so that they can all be encouraged to do their best" - because she knew what a littlest show of kindness to the staff by the big name stars meant when she was just a nobody. That's a kind of character and leadership that many artists and entertainers aren't very good at. But it's an attribute I so admire about her and something that keeps me a real and growing fan of hers each week even after 3 years! And we've come to trust that she's working really hard, especially when she's not very visible because she's devoting herself to not just the roles she's playing, but also looking out for those around her on the set that are partly her 'responsibility' to show care and love for. This is what will make her go far and be even more loved by all fans the world over. Of that I am certain. Says the first episode is May 15! Google Translate keeps on using the words "smoke" and "cotton", when translating Korean to English. From the context, it seems like "smoke" is referring to (acting) ability/prowess, and "cotton" is something like awards, or maybe recognition? Can anyone with Korean Language Powers tell the class about "smoke" and "cotton?" Thank you @meechuttso for your translation and thank you @kokkuri33 for sharing good news. Finally, we see script reading news and know the premier date is May 15th, yeah !!! (but actually I prefer Mon-Tue so it will not be the same time as 'Vagabond' which premier on May 8th). 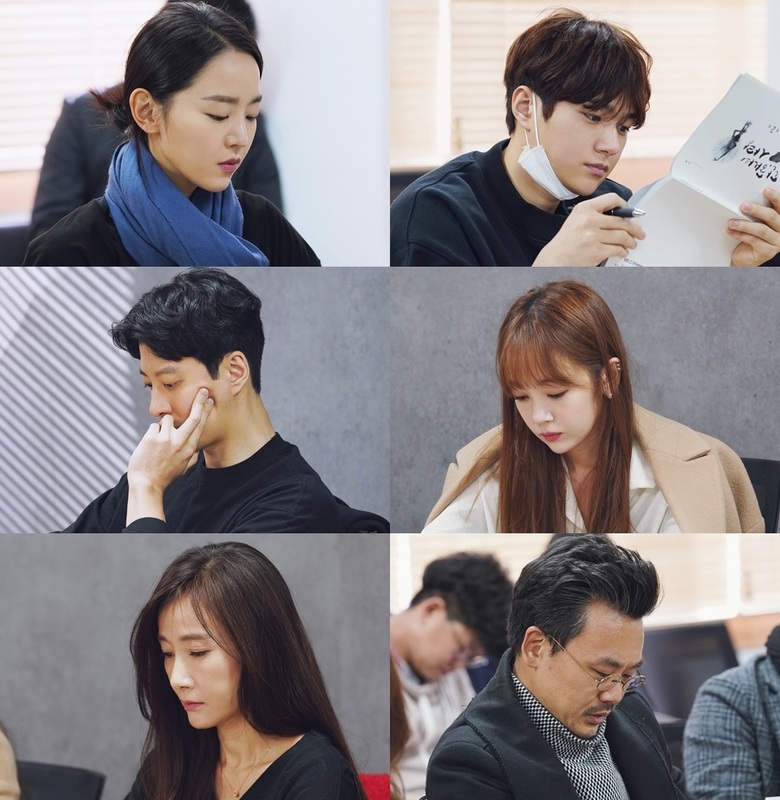 Just want to post script reading photo here. About the vocab, I think 'smoke' came from '연기' (yeon-ki) which has another meaning as 'acting/performance'. But I couldn't find 'cotton' from my google translation. Why we don't get long interview like this from KBS for Shin Hye Sun ? Look at how TVN promoted their drama 'Abyss', this drama got male lead confirmation later than 'One and Only Love' and not confirm exact air date yet but now they can release first script reading video with lead couple interview, while KBS just released unofficial clip and deleted later. And she is so cute and bubbly. Love how she drummed the box . Thank you so much Carlyn for giving us lots of SHS pics and clips lately. Can anyone with Korean Language Powers tell the class a﻿bout "smoke" and "cotton?" Heart-fluttering scene of "Dan, Only Love" script reading revealed. Coming this May 15th in its first broadcast, KBS 2TV's new W/Th drama 'Dan, Only Love' (Writ Choi Yoon-Kyo/Dir Lee Jung-Seob/Prod Victory Contents & Monster Union), is an unpredictable, fantastic, heavenly romance portraying the story between icy ('toxic','caustic') ballerina Lee Yeon-Seo (by Shin Hye-Sun) without a hint of love [in her heart] and happy-go-lucky trouble-maker angel Dan (by Kim Myung-Soo). Feasts of dances to saturate our family room (theaters), ballerina and an angel's brilliant ('blindingly bright') meeting foretelling, is gathering our interest. On January 18th on location at KBS, at the script reading for 'Dan, Only Love' were Shin Hye-Sun, Kim Myung-Soo, Lee Dong-Gun, Kim Bo-Mi, Do Ji-Won, Kim In-Kwon, etc., actors and director Lee Jung-Seob, writer Choi Yoon-Gyo, the entire cast appeared. The actors, already deep in their characters, showed off energetic acting already resembling an actual shoot, drawing our gaze. First off, Shin Hye-Sun painted the prickly and formidable ballerina 'Lee Yeon-Seo' with colors as only she could have. Shin Hye-Sun, who had come with total preparation of the character, immersed herself immediately into the action, raising anticipation for her fresh ballerina transformation. Kim Myung-Soo, appearing as a happy-go-lucky trouble-maker angel 'Kim Dan' (he has a last name! LoL! ), abruptly rising out of his seat to carry out his acting, heated up the location. Capturing the not-yet-ripe angel Dan's appearance with his overflowing raw emotions, was a preview of his fervent acting in the drama. In fact, Shin Hye-Sun and Kim Myung-Soo's fresh collaboration in 'Dan, Only Love' is a particular point of anticipation. The two thespians painted with fantastic chemistry the meeting of ballerina 'Lee Yeon-Seo' spewing cold venomous speech versus angel 'Dan', full of curiosity. Raising anticipation from the very first moment of their synergy ('breathing'), how this meeting of Shin Hye-Sun and Kim Myung-Soo's will unfold on screen is indeed drawing our focus. Lee Dong-Gun is artistic director of the ballet company, 'Ji Kang-Woo' (or Gang-Woo), showing off his charisma. In the story Ji Gang-Woo is a possessor of unequaled artistic sensibility ('discernment'). Lee Dong-Gun, with the foundation of solid acting skills, painted a picture of an attractive grown man and an artist. Too, the transformation of Kim Bo-Mi, from actual ballerina background, is drawing our interest. 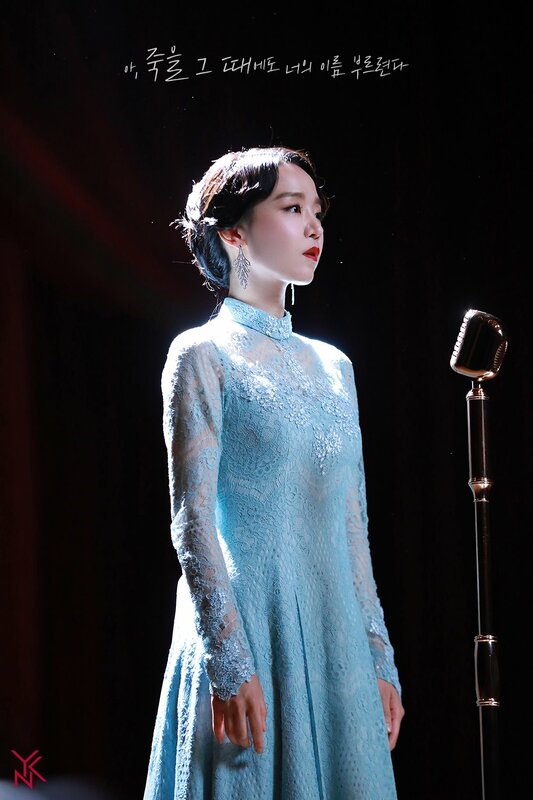 In the story Kim Bo-Mi will take on the role of 'Geum Ni-Na', a ballerina who feels an inexplicable ('peculiar') sense of rivalry from Shin Hye-Sun. With outstanding ballet skills and experienced (grounded/stable) acting, we can forecast her solid 'eye-imprints' from the viewers. Neither can we leave out premiere actors Do Ji-Won and Kim In-Kwon's presence. Do Ji-Won is taking on ballet company 'CEO' Choi Young-Ja's role. Choi Young-Ja is a character overflowing with ambition who will stop at nothing for prospering of her company. Kim In-Kwon, appearing as the arch-angel 'Who' (Hoo), will create with Kim Myung-Soo the senior-junior angel chemistry in the story. The story full of synergy of actors full of dramatic abilities, is increasing our degree of anticipation (immersion). Most of all on this day, at 'Dan, Only Love' script reading, (contemporary) professional ballerinas also participated, adding to the specialness of the occasion - drawing attention to the thorough preparation for a work that is complete as a ballet drama. Modern dancer Choi Soo-Jin, well known for her 'Dancing 9', as the one in charge of delivering the beautiful stage of 'Dan, Only Love', was present as choreography director on site and drew attention. A script reading over 4 hours in length, yet without a hint of tiredness as each was immersed in their individual parts. Shin Hye-Sun, Kim Myung-Soo, Lee Dong-Gun, Kim Bo-Mi, Do Ji-Won, Kim In-Kwon, etc., the actors confirmed their synergies, and director Lee Jung-Seob led the effort with detailed orchestration. 'Dan, Only Love', from its very first day of work showing off fervent energy and immersion so brilliantly thus, just how fantastic a drama will be unfolded (for us) is adding to our anticipation. Quoted from the other room - page 5 baby! Ohh my. Her first Unboxing video is Soooo adorable! She talks the whole time in 'banmal' (as if to a close friend). And comes with 2 straps! And it's all purpose and perfect for meeting friends or hanging out on campus... She's really peddling her wares too, completely adorable! I gotta update the first page with the arch-angel, her Sun-Bae (senior) at YNK, too. Finally, we see script reading news and know the premier﻿ date is May 15th, yeah !!! Hurray! Finally we get a premiere date. I actually prefer Mon Tues too but I think KBS probably wants to bank on this drama to see if they can make a surprise competitor for Vagabond... since on paper, they will lose the ratings fight anyway, so might as well put the drama they think they have best and DOL may just be their best ensemble during that May period. I'm not sure what follows Dear Citizens but it may be that they feel DOL have a better chance than the other upcoming drama. Nothing we can do except to pray and hope DOL will do well. Now I'm waiting for Doctor Prisoner to end lol! I think we may get to see more teasers soon. May please come faster!